This is it kids, Halloween is just around the corner and I've got a few more reviews coming at you, every day from now until then. 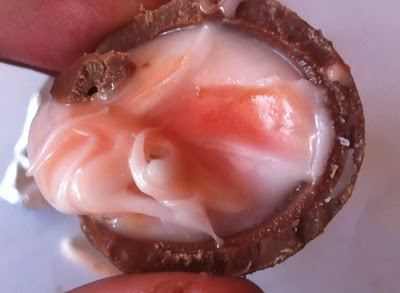 Today we're checking out another creme egg, the Scary Eye! Holy moley, just looking at that thing gives me the creeps! When you're talking about Halloween products either going the cute, or the scary route on their marketing I'd say this one is pretty clearly on the side of scary. This is like some sort or beast who escaped, and all we managed to capture was his eyeball. Now of course we should eat it! There's an inherent gross out factor here that you can't avoid. Seriously this is asking us to eat a bloody animal eyeball! That entire proposition is creepy. That said, I like the packaging a lot. Yes, my tastes lean much more towards cute than scary when it comes to these things, but I appreciate good work, and this is fantastic design work. Why hasn't anyone else done bloody eyeballs before?! And for that matter, creating another chocolate egg at all is a bold move that I heartily applaud. I'm almost certain that tis product is from a French company called Cémoi. I picked it up in the aisle at a Dollarama outside of Toronto. I say this because I have no idea if anyone else can even find this candy. If so let me know in the comments below. I had the sense to take a quick photo of the box the Scary Eye came in at the store. But no where on it could I find the name of the actual manufacturer. I must've missed it somewhere... Anyhow, thats a pretty creepy box too. This is "Strawberry Flavored Fondant". A white eye 'egg' with a red and bloody looking 'yolk' - whats not to love. Lets have a look at this thing unwrapped. 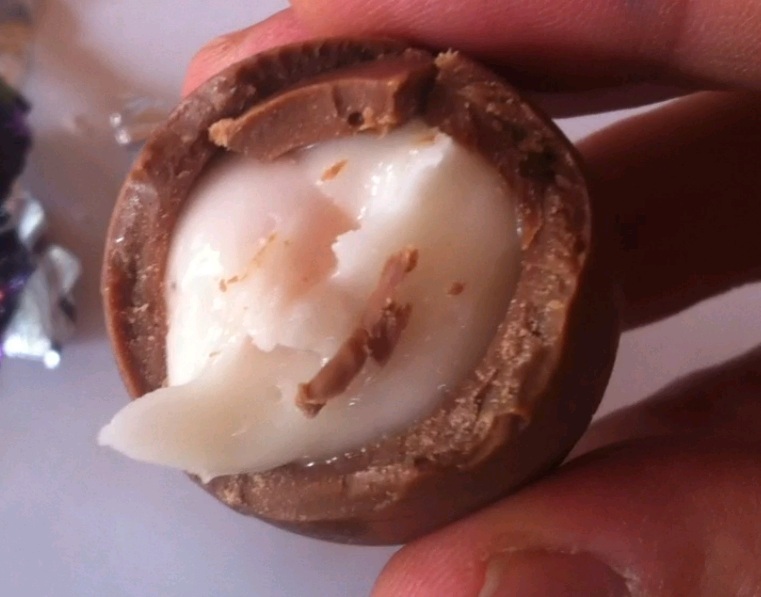 Well it certainly doen't look much different than your typical Cadbury Egg when you get down to it. 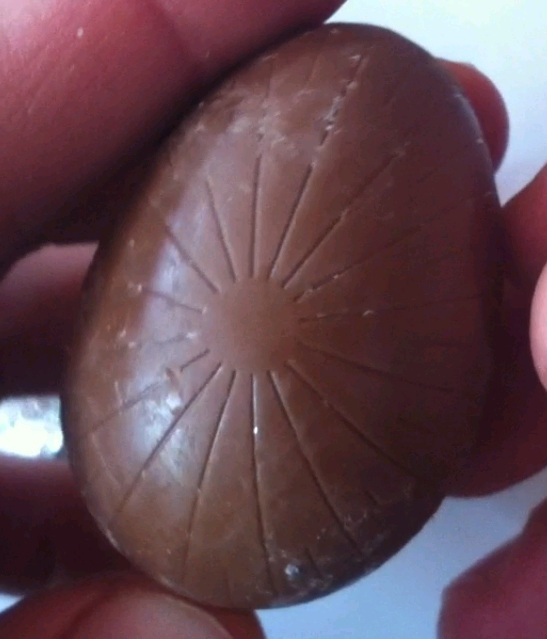 Its even got the same star pattern scoring across the surface. Could that be a product of the manufacturing process? Its a different patten than Cadbury, but I like it. One thing the Scary Eye doesn't have that the Cadbury Eggs do is the immediate an almost overpowering smell of high quality chocolate. This smells fine in the way that a good chocolate should, but I love the entire unwrapping process of the Cadbury Eggs and the smell is a part of that. And for the record, I don;t think you can possibly hope to review the Scary Eye without comparing it to the Cadbury Eggs. They are the gold standard that must be compared to by anyone entering this space. Biting into the egg initially there are a number of things to address. The chocolate is smooth and delicious. The fondant is a bit firmer than I like, but perhaps that's just the temperature in the room. The flavor though is like a super blast of pure sugar. This is very sweet. Not too much, and the chocolate tempers it, but the Scary Eye borders on going too far. I am definitely a fan! Still though, despite the slightly pink-ish color I'm not tasting the strawberry. Better dig down to the yolk. Ok, so here we are, I found the yolk, finally. It wasn't all together in a nice ball like you'd find in a Cadbury Creme Egg, or in the picture on the box above. Nope, this yolk was spread out, mostly dissolved and mixed into about 2/3s of the center postion of the egg. My guess as to why this happened is because the yolk part of the egg, the red blood center, is actually strawberry jam. It really tastes exactly like jam, and a thin syrupy kind of jam at that. 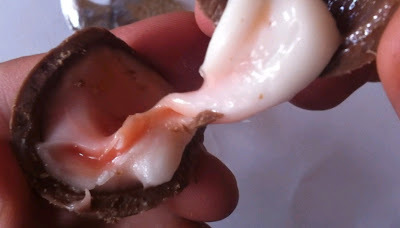 The liquid density is totally different, the properties are different than the fondant white, and so it slowly just seeped into the rest of the egg. While on a design front I'd say that's too bad, on a taste front it actually worked out great, because this is really awesome! I'm a fan of strawberry jam, I'm a fan of the super sugary fondant goo and I'm a fan of the chocolate. This is a great product. Its got some scary packaging, but a sweet interior. The texture is nice with a good blending of chocolate, to sugar goo, to jam. Overall, if theres a way to find it, you should definitely seek out the Scary Eye, and try it. Like I said, I'm not 100% positive, but I believe this is a product from a company called Cémoi, you can find them here. Or I purchased this at the Dollarama, maybe you've got one near you. best of luck finding your own Scary Eye! My mom picked up a few of these eggs when she vacationed in new Zealand, & googling to find more info about it brought me here. She picked them up from a sort of bin, so there was no outer box. The foil on mine said 'Smooth Eye', weirdly enough but otherwise looked the same & had the same filling. They are in fact made by the French brand Cemoi, mine was clearly labelled as such. And the fondant on mine was perfectly gooey, which makes me think your room temperature was definitely at fault! Thanks for the detailed review.